When it comes to abstract ambient music, there is heavy-duty (from an emotional standpoint), then there is HEAVY-DUTY. An album documenting an artist's reaction to Hurricane Katrina's devastation is bound to be the latter. 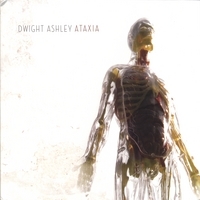 Dwight Ashley always makes challenging and provocative albums featuring music which is frequently dark and disturbing. However, even by his standards (he himself states in the liner notes "frankly, it may be asking too much for someone to sit through this sort of material without wanting to break something". ), Ataxia (i.e. the "inability to coordinate voluntary muscle movements") is tough-sledding. Containing only scattered moments of outright musicality and conveying dark, sober and somber moods (but not scary per se), the CD certainly does a number on your psyche, provided you immerse yourself in it, which, I think, is the point of it all. As a depiction of Katrina"s disastrous aftermath and the resultant despair which settled over the Gulf Coast and New Orleans area (where Ashley recorded one of the CD's tracks, pre-Katrina), Ataxia works disturbingly well. Ashley used synthesizers, samples, guitar and some keyboards as instruments. However, only occasionally will you be able to pinpoint what you're hearing, such as the plaintive pealing of electric guitar and feedback on the title track, as it morosely cries over a bed of loud drones and what sounds like escalating church organ chords. More often than not, the music on Ataxia should be viscerally explored. An earlier review of this album described it as immersive. While I agree with that assessment, don't treat it casually. Getting "too" close to songs like "When The Waters Came", "Circus of Sharp Toys", "As We Became Complacent" and "Our Dark Shallow Spoil", could have you reeling (again, though, that may be Ashley's intent). On some tracks, the cacophony of synths, tones, drones, and sonic manipulations may overwhelm you. Pieces like When The Waters Came with its swirling synth washes, clanging reverberations, swells of keyboards and abstract textures, accurately convey the abject horror of advancing floodwaters. Despair mingles with awe at the sheer force of the cataclysmic event (conveyed through the juxtaposition of "music" with "noise" in the track). Moments of calm (e.g. Dance Of The Wobbler with warm warbling synths, gently undulating drones, and metallic shimmerings) provide needed respites from the dominant dread, e.g. the ten-minutes of abstract tones, noises and drones in As We Became Complacent. Sometimes Ashley uses a conventional approach to conveying emotion, such as the adagio-like Withdrawal Of The Many an achingly sad portrait by synth strings and woodwinds, building toward a chaotic climax midway through the track with the clanging of a railroad train traveling down its tracks mixed with the dramatic crescendo of pipe organs before fading out into a warm wash of keyboards. Days Into Years, is a sparse piano tone poem, with the unsyncopated minor key notes jingling-jangling in random patterns of melancholy, an avant garde exploration of the instrument but not overwhelmingly alienating to traditionalists. Recommending Ataxia is like suggesting someone watch a dreary and depressing yet brilliantly-made movie (e.g. Journey of Hope). There's no denying the art and craft of what Ashley has done. The question is simply how best to approach and appreciate this album. It's meaningless when played as traditional "background" ambient, yet Ashley is spot on when he questions if it's too intense to be digested all at once. On the other hand, listening to it in bits and pieces misses the point and lessens the impact. If you can handle "music" which may weigh down your soul over its sixty-plus minutes, than I certainly do encourage you to listen to Ataxia. Just remember that when it's over, you can go back to your normal life, which is more than can be said for some Gulf Coast residents.